The French word for author, “auteur” is used in the film industry to describe when a film fully reflects the creative and imaginative perceptions of one person. Auteur Winery, home to some of the truly fine wines available for tasting on the Sonoma Square, reflects the passion and meticulous energy of Kenneth Juhasz, whose efforts in creating high quality cool-climate chardonnay and pinot noir has earned him recognition as a “winemaker who has made a difference” from Wine Spectator magazine. 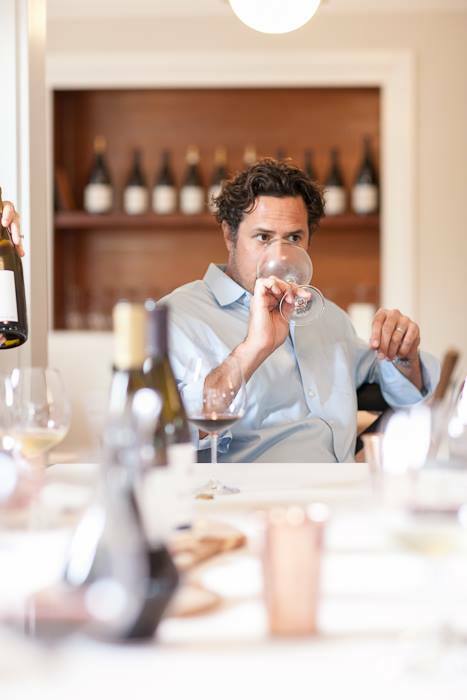 Kenneth owns Auteur with his wife, Laura, sourcing grapes from some of Sonoma and Napa County’s outstanding vineyards to create his exceptional wines. Juhasz has a hands-on approach at all stages of winemaking resulting in a prodigious collection of low production, high quality wines that are becoming more recognized. I was introduced to Auteur a few years ago and enjoyed the wines tasted, but with the expanding market and choices, lost contact. Eager to re-visit the experience, we made arrangements for a tasting of 2012 releases. 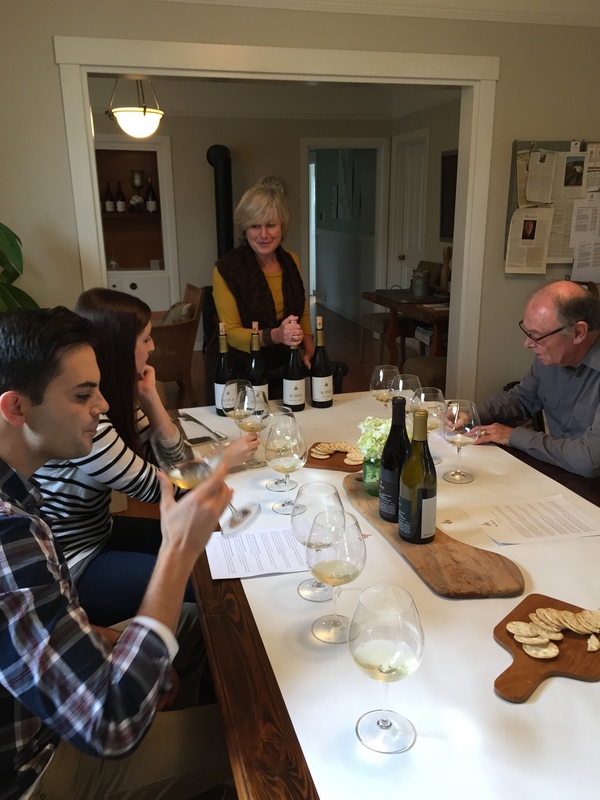 Among many options near the Sonoma Square, Auteur Winery and Sojourn Cellars offer the best environment for an informative and personalized tasting, all for $25.00 per person. Located in a quaint cottage on First Street, a few doors from Sondra Bernstein’s “The Girl and the Fig” restaurant, the Auteur tasting room provides a very comfortable setting for a comprehensive tasting that leaves one with the impression of a more refined wine acumen. Today, we are joined by my son, his fiancee and our host, Bobbi Cohen, to discover the different nuances of each vineyard producing the fruit for their chardonnay and pinot noir. We began tasting the coastal influenced chardonnay, some from Napa County’s Carneros region and the others from the Sonoma Coast. Like many modern winemakers, Juhasz does not own a vineyard, so selection of those from which to source grapes is an essential part of the production process. The 2012 Auteur Carneros Green Acres Chardonnay ($42), receiving a 90-point rating from Wine Spectator, lived up to its reviews with expressive fruit and a crisp acidity. Stone fruit and green apple flavors with an extended finish will definitely get your attention. Once again from the Carneros region, the 2012 Auteur Carneros Hyde Vineyard Chardonnay ($45)closely resembled a Burgundian wine with crisp, complex flavors and a nice, rich minerality. Robert Parker labeled it a “California grand cru,” reviewing the wine at 94-points. I have, in my cellar, at least three different wines from the Durell Vineyard at the Sonoma coast, all of them standing out, all with a similar opulence. The 2012 Auteur Durell Vineyard Chardonnay ($45) is no exception. A rich, creamy mouthfeel with ripe flavors of peach, pear, melon and spice has led to ratings in the mid-nineties. For me, this was the one to take home. Actually originating from vineyards in Green Valley, Carneros and Sonoma Coast appellations, the 2012 Auteur Sonoma Coast Chardonnay ($32) is a terrific wine and outstanding value. The Durell, Dutton and Green Acre Vineyards all contribute to fresh fruit-forward flavors, a rich minerality, a lingering finish and a 90-point rating from Wine Spectator. The warm, relaxed setting of the cottage made the perfect environs to discover the nuances of this varietal from different micro-climates. There is truly a chardonnay here for all palates. With ideal climate conditions for the 2012 vintage, many experts feel these white wines can age several years in the bottle. We anticipate that repetition of this process with Auteur’s pinot noir releases will be equally rewarding. Having previously tasted a past vintage of the Manchester Ridge, we were prepared to compare the subtleties of four diverse pinot noir vineyards. Autuer’s pinot vineyards are a bit more eclectic in that they are represented by Oregon’s Willamette Valley, Mendocino County’s Anderson Valley as well as the Sonoma Coast. Organically farmed and clearly the most savory of the current releases, the 2012 Auteur Savoy Pinot Noir ($45) comes from an Anderson Valley vineyard, acclaimed for the past two decades. An exceptional bouquet and concentrated, layered flavors result in a special wine, limited only by small production and high demand. Another 90-point rating, another sell-out leads to anticipation of the spring release. There has been much written about the 2012 vintage of Oregon pinot noir, describing it as the best in years. Add the Yamhill Carlton AVA Shea Vineyard that has produced many luscious pinot’s over the years and the 2012 Auteur Shea Vineyard Pinot Noir ($60) is a wine that deserves attention. Wonderfully aromatic and balancing a multitude of flavors, it warrants the accolades it has garnered and can be cellared for a few years to fully blossom. Our last wine, the only multi-vineyard pinot noir of the tasting, was blessed with inviting aromas and a surprisingly complex array of savory and concentrated fruit flavors. The 2012 Auteur Sonoma Coast Pinot Noir ($42) offers an eloquent bouquet and complex fruit and spice on the palate. An excellent wine for the price and boasting mid-nineties ratings, it became the one for me. 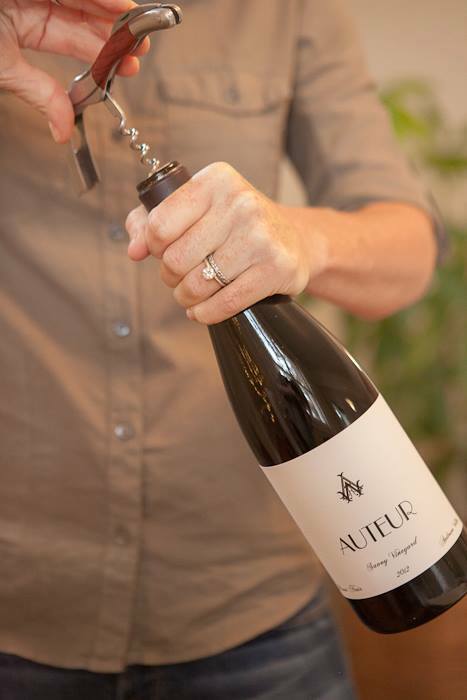 With no shortage of high quality chardonnay and pinot noir in Sonoma County, Auteur Winery is a pleasant find and their wines can stand up to any, deserving the attention of those who are serious. The winery establishes a mailing list to inform interested consumers of new releases that are all available on-line. With growing popularity, four of the fall wines that we tasted are now sold out, emphasizing the need to network. With an abundance of vineyards and wineries in Sonoma County, some care must be taken when selecting wines. Auteur wines has the accolades and will soon to be discovered by fine palates everywhere. This entry was posted on Monday, February 16th, 2015 at 9:12 pm	and tagged with Auteur Winery, chardonnay, Pinot Noir, Sonoma Square, The Girl and the Fig and posted in Uncategorized, Wine. You can follow any responses to this entry through the RSS 2.0 feed. Good one Lyle! Makes me want to taste the pinots. Like the photo of you, Cole, and Taylor.